While a good case can be made that any time of the year is a great time to absorb the Grand Canyon's beauty, certain seasons lend the breathtaking quality to that beauty. Some months of the year provide a clearer view of landmarks and details that can be obscured by the hazy conditions present during part of the year. The weather is probably better throughout the entire canyon from April to June. Temperatures are mild and rainfall is at its lowest. The worst times are likely July and August. Not only are they the busiest months, they are also the hottest and rainiest months of the year. When it comes to planning Grand Canyon tours, enthusiasts agree that the best times to visit are from March through May, and from September through November because of the mild temperatures and fewer visitors. 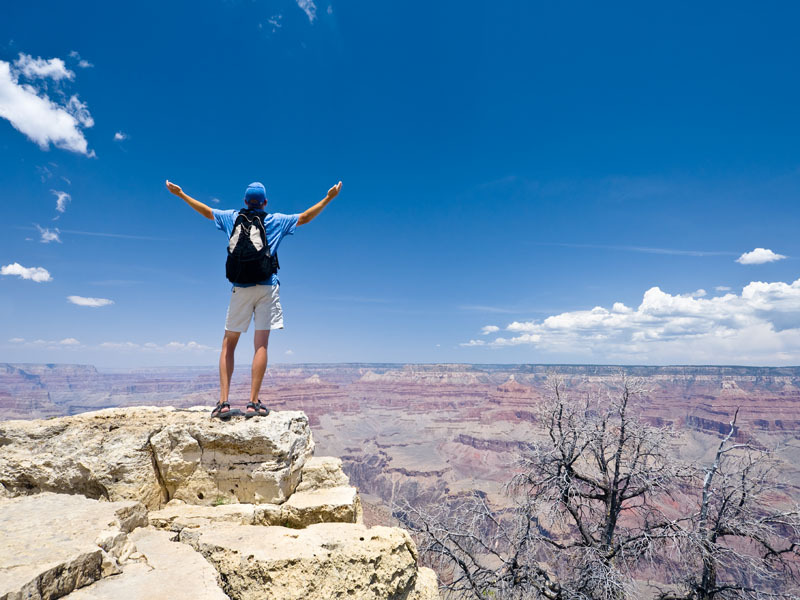 Mid-March through mid-May marks one of the two best times of the year to visit the Grand Canyon. The daytime temperature is mild, chances of rain are low and it is not very crowded. Downsides of the March through May stretch include the possibility of lingering snow that keeps the North Rim off limits to vehicle. With only 10 percent of park visitors making the North Rim their destination, many consider it a pristine destination within the Grand Canyon. Spring is arguably the best time of year to hike the inner trails along the South Rim, as it is too hot for most hikers during the summer months. Wildflowers abound in the spring and combined with mild weather and clear views make for a fabulous hiking experience. Whitewater rafting is good along some portions of the Colorado River during the spring, while other river areas are perfect for pontoon riverboat rides. The West Rim is home to the Skywalk. 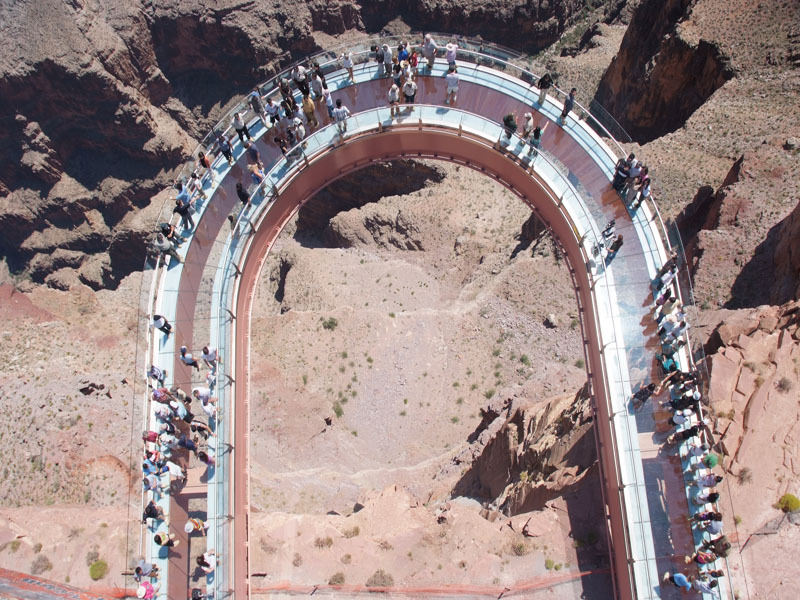 Stretching 4000 feet above the canyon floor, this horseshoe shaped walkway extends out and over the canyon with only a glass floor between you and 4000 feet of open air. Other landmarks located along the Western Rim include the drive through Joshua Tree National Forest that is necessary to reach the West Rim. Run by the Hualapai Indian tribe, the West Rim contains the Eagle Point formation, Guano Point, access to a portion of the Hoover Dam as viewed from the O'Callaghan-Tillman Bridge and other gorgeous attractions. Summer is the peak season, it’s packed with people and hotels are hard to find. Weather near the rims is nice, but the canyon floor often reaches temperatures over 100 degrees during the summer months. Temperatures near the Colorado river can soar as high as 120 degrees. Weather along the North Rim tends to remain cool to cold. July is a good time to see the canyon from the North and South Rims. Conversely, July is not very hospitable due to the crushing crowds of visitors and the earth scorching temperatures on the canyon floor. Additionally, July brings lightning along with heavy rainstorms to cause havoc to sightseeing plans. Although the thunderstorms appear suddenly with little or no notice, they usually do not last very long. Prepare for extreme changes in weather several times a day. Pack warm clothing and some good hiking shoes if you are camping or hiking at any time in the Grand Canyon. Summer evenings bring more bearable temperatures, so plan some touring activities during the long light available during the summer evenings. Day hikes or treks are more comfortable if you plan to get an early start before 7:00 a.m. Crowds typically become noticeable starting around 9:00 a.m.
By far the most popular destination, the southern rim is extremely crowded during the summer months. Easily accessed from the highway, the southern rim remains a popular stop for families and tourists. Park rangers welcome the summer visitors but ask them to use caution during popular canyon activities. Many hikers do not know that you must hike uphill to get out of the canyon at the end of their hiking day. Lack of water, extreme heat and cold and isolation are common problems facing day hikers as well as overnighter hikers. Mental attitude and adequate water consumption are the two factors that matter the most when hiking anywhere in the Grand Canyon. Even casual hikers should prepare for frequent weather changes, several times a day, anytime of the year. Sudden thunderstorms cause flash floods and bring lightning that sparks fire anywhere throughout the canyon. Marked by mild daytime temperatures, this is the other time of the year when seeing the Grand Canyon is at its best. After mid-September there are limited crowds and the space has a more comfortable feel overall. The Fall is a lovely time to explore the South Rim's landmarks that include Fortification Hill, an extinct volcano, parts of Hoover Dam and Dragon's Corridor. Mid-September to mid-October is the only predictable time of the year when the entire Grand Canyon is open for visitors. Heavy snowfall shuts down the road leading to the North Rim starting with the first snowfall in late October. Shorter days cast a glowing autumn light throughout the canyon, it is especially spectacular when viewed while hiking the South Rim's inner canyon trails. Prepare for harsher hiking conditions by mid-October when the temperatures start falling below the freezing mark. 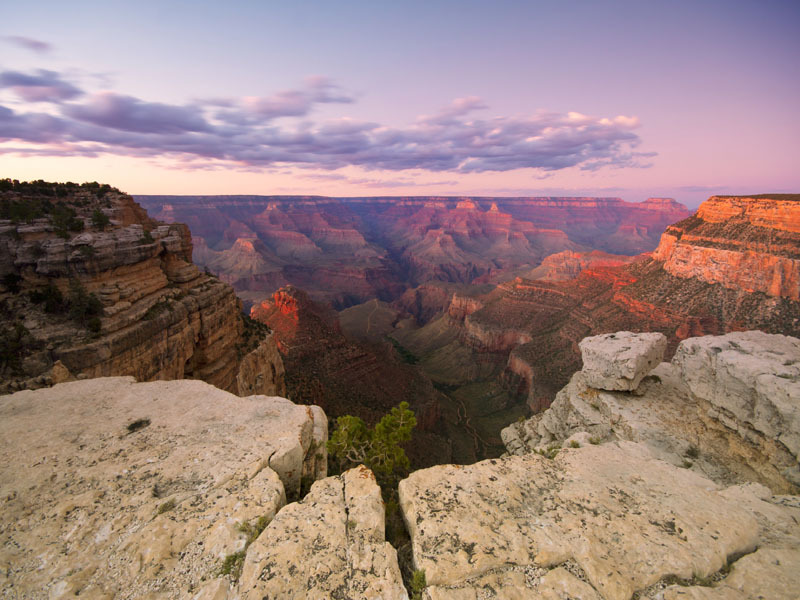 The North Rim is accessible by car beginning May 15 and ending October 15. Downsides to November visits consist of closures to many areas, including the North Rim, and little or no access to more lodging, food or activities. Although the North Rim's road remains closed, access is allowed using snowshoes, skis or by foot by using backcountry permits. No facilities for food or lodging are open along the North Rim. 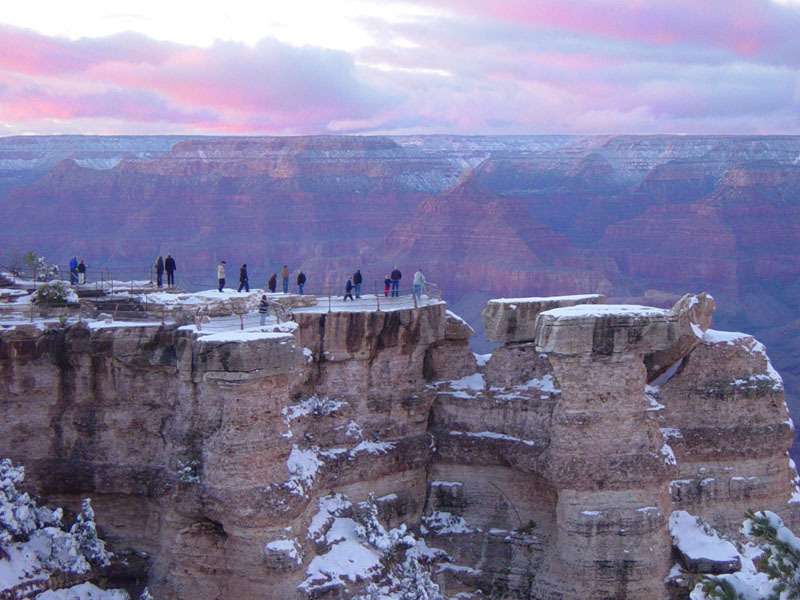 Some people prefer the spectacular beauty winter snowfalls bring to the Grand Canyon. The North Rims average snowfall is 200 inches each winter. This is the most peaceful time of the year and discounted rates are available for lodging and activities within the park. Many South Rim trails remain accessible as the South Rim stays open all year. Average snowfall along the Southern Rim is five feet. Surprisingly, while the Southern Rim is colder near the top, the bottom of the canyon often has spring like temperatures during the winter. Bright Angel Campground or Phantom Ranch are great places to stay during the winter months. If you plan to visit during this time, keep in mind that all canyon views can temporarily be limited or completed blocked during winter storms. Furthermore, the National Park Service does not issue refunds when the canyon views are obscured. No matter when you plan to visit the Grand Canyon, it is the ideal time to experience all that nature offers. Like a deliciously layered dessert, the Grand Canyon's layers hold mysteries that change during every season. Each time of the year holds a surprise wrapped in a brilliant package containing another facet within the Grand Canyon.